When Microsoft first mooted Windows 8, the common thought was that while people would use Windows 8 tablets, there wouldn't be a demand for Windows 8 touchscreen laptops. Or that they'd be too expensive. It turns out that the research from both Microsoft and laptop manufacturers proved that wrong - people are prepared to move between using a trackpad for standard PC work and using touch to navigate Windows 8-style apps in the Start screen. What's more, laptops such as this, Asus' brand-new VivoBook S400C, are priced lower than we'd expected. Admittedly, this unit only has a Core i3 processor, but the 1.8GHz dual-core chip will still give you very good performance - we've been using Windows 8 on a 1.4GHz dual-core Core i3 Toshiba Z830 Ultrabook without issue or lag. The touchscreen display is a reasonably sized 14.1-inch unit - its edge-to-edge glass helps, since you can use the Windows 8 edge gestures easily. We find 14-inch strikes the right balance between portability and usefulness. You don't get a full HD display - resolution is 1,366 x 768 - but it's fine for playing back most media. The screen is powered by Intel's own integrated graphics rather than having a secondary Nvidia or AMD chip. In terms of the other core specs, you get a perfectly reasonable - if not over-generous - 4GB of memory, while you also get a 500GB hard drive. That's plenty of storage for all the photos and music you'll need, although if you're really into home videos you'll probably need to think about some external storage at a later stage. The look and feel is wonderful and the body is just 2cm thick; the black brushed aluminium lid and edge-to-edge glass also complement the silver elsewhere. The only unfortunate element of the look and feel is the weight - it's nigh on 2kg. Ports are generous (note there's no optical drive). On the right there's full Ethernet, VGA, HDMI and USB 3.0 and a further two USB 2.0 ports, as well as a Kensington lock slot and SD card reader on the other side. We're surprised more USB ports aren't USB 3.0 these days, but it seems they just cost too much money. The provision of VGA as well as HDMI is welcome for older displays while we're also pleased that many Windows 8 laptops still have Ethernet ports too. Elsewhere on the left of the laptop, the headphone and external microphone jack is now a single port - built-in microphones are so good you rarely need an external one. Beefed-up audio comes courtesy of Asus's SonicMaster technology. The sound isn't the best we've heard, but it's better than many notebooks. The VivoBook S400C provided 3.5 hours of battery life in our tests - we tested at high performance but we felt that it should have been more; if you used this laptop for work, you'd need to charge it at some point during the day. Likewise for media use. It's not designed to be as battery efficient as many more expensive and smaller laptops like Ultrabooks, but even so we would have hoped for a little more life. The Chiclet-style keyboard is rather good to type on, though it lacks the springiness of some. You can press to click on the trackpad itself, but the trackpad's two buttons feel slightly tinny-sounding when you depress them. It's not that they're flimsy, it's rather that we found them slightly annoying sounding when pressed. Unlike the gesture support with the touchscreen, the trackpad's gesture support was disappointing; while Windows 8 gestures are supported, we could only get them to work sporadically. We know it's perfectly possible to produce trackpad software that's fully compatible with Windows 8, so there is work to be done here. We also felt it was a real shame that even with Windows 8, Asus still insists on providing extra unnecessary software with its laptops. Here McAfee Internet Security is the main piece of bloatware - the desktop app keeps pressing you to activate without ever explaining why. There's nothing to say how long it will be before you need to buy a full subscription, for example, and no option to uninstall from the app itself. A shame. We are disappointed by a few aspects of the VivoBook S400C: notably the battery life and touchpad gestures, but the overwhelming sense is that the S400C is a very good laptop. It doesn't break the bank and doesn't provide unnecessary expensive hardware. The spec sheet features a decent level of equipment that runs Windows 8 smoothly and should provide you with the power you need. And it's a beautifully appointed laptop for the money. 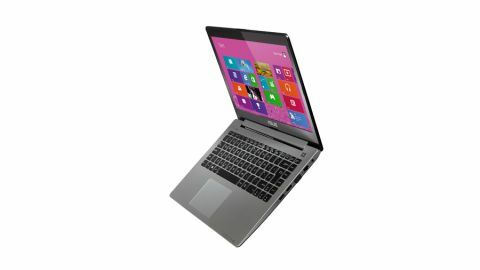 It looks almost like an Ultrabook as well; your friends just won't believe that it was only £500.